LIBERAL, Kan. – In conjunction with October being Breast Cancer Awareness Month, the Seward County volleyball team will hold its annual “Dig Pink” fundraiser match on Friday, October 19, when the Lady Saints take on the Butler Grizzlies in the Greenhouse at 5:30 p.m.
We are asking for the support of Seward County fans as we set out to bring awareness to a disease that affects so many and raise funds to benefit The Side-Out Foundation. All funds raised will be donated to the Side-Out Foundation and applied toward a clinical trial specifically for patients with Stage 4 breast cancer, the most advanced form of the disease and the least funded area of research. The goal is $500 by the end of October. 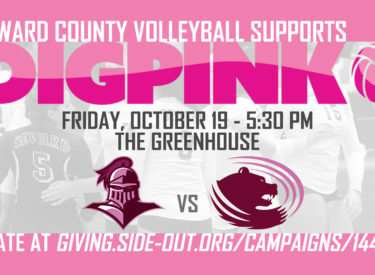 Help the Lady Saints Pink Out the Greenhouse on the 19th by wearing pink to the game. To donate, fans are encouraged to visit the online fundraiser page, https://giving.side-out.org/campaigns/14430#/. There will also be donations taken at the game.